The Jupiter JHR1000M Bb Marching French Horn features a .468 inch bore and provides powerful projection. With the strong sound of the Bb side of a double horn, the JHR1000M makes the upper range of marching music easier to play and more dramatic in tone color. The Jupiter JHR1000MN Bb Marching French Horn features a .468 inch bore and provides powerful projection. With the strong sound of the Bb side of a double horn, the JHR1000MN makes the upper range of marching music easier to play and more dramatic in tone color. 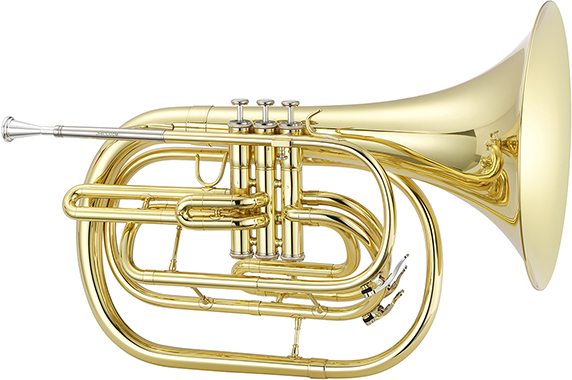 The Jupiter JHR1000MS Bb Marching French Horn features a .468 inch bore and provides powerful projection. With the strong sound of the Bb side of a double horn, the JHR1000MS makes the upper range of marching music easier to play and more dramatic in tone color.